June 14, 2012, in Downtown Los Angeles. LOS ANGELES — No matter what direction you looked, if you were on or around Figueroa Street in Downtown Los Angeles on the morning of June 14, from the Financial District on the north, to Staples Center on the south, all one could see was a massive sea of people. 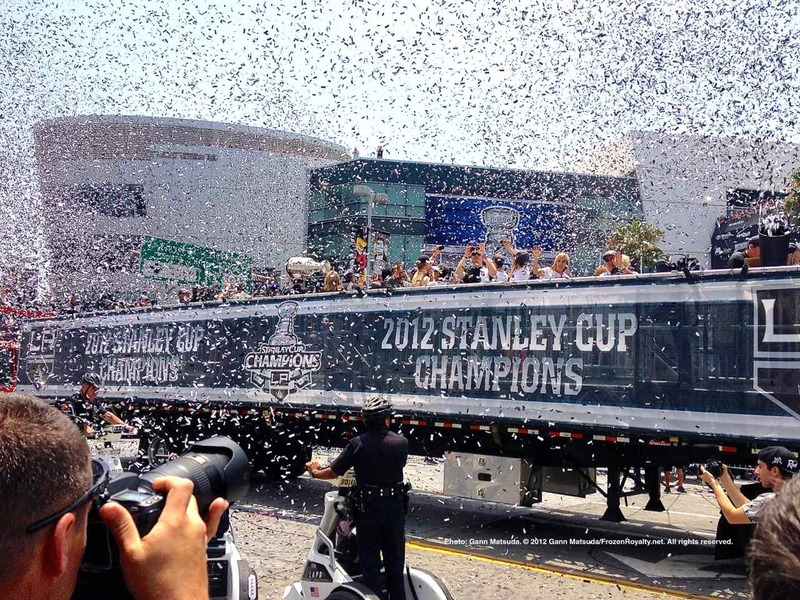 The Los Angeles Police Department estimated that approximately 250,000 people attended the victory parade honoring the Los Angeles Kings, who won the National Hockey League’s 2012 Stanley Cup Championship on June 11, the first Stanley Cup in the 45-year history of the franchise. Following the parade, a rally was held inside Staples Center, where team officials, players and coaches addressed the capacity crowd of over 18,000 fans. Between the parade and the rally, one thing was crystal-clear: while the team and Kings staff have been celebrating their victory over the last couple of days, Thursday’s parade and rally were about sharing that celebration with the fans, thanking them for their support, and thrusting them into the forefront of the party. Walking up and down the parade route, people were everywhere, many wearing Kings T-shirts and jerseys. Some had grabbed prime viewing spots as early as the night before. A mass of humanity that was truly representative of Los Angeles, the most culturally diverse city in the world, lined Figueroa Street, often seven or eight rows deep. They stood in office windows, and many lined the walls of parking structures, pennants and signs in hand, cheering for their team. The same could be said of the crowd at the rally inside Staples Center, and at both events, that diversity also extended to the wide spectrum of fans in attendance, in terms of their longevity and experience. 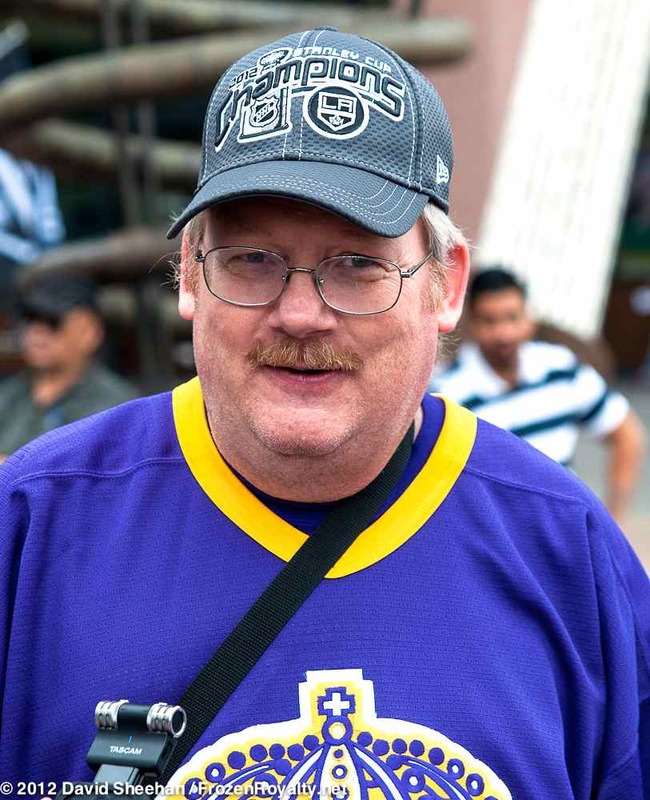 Billy Lyttle started following the LA Kings in 1990. 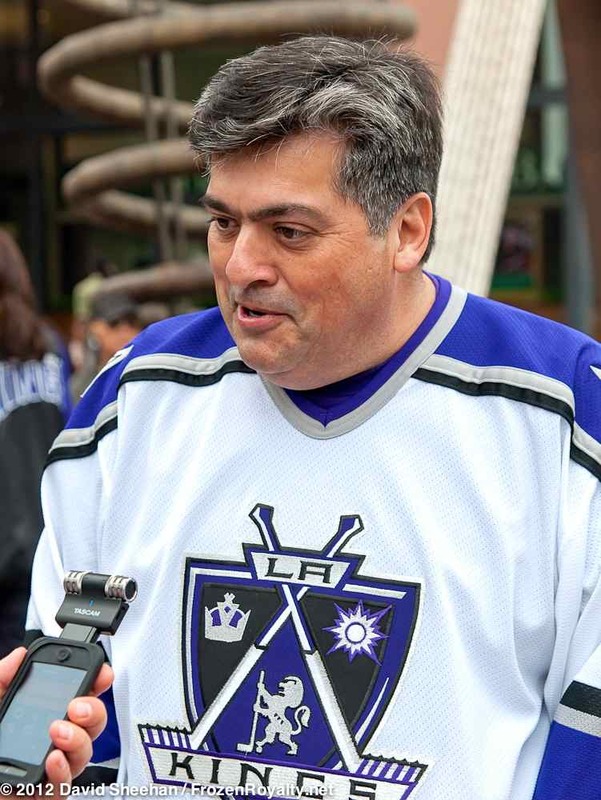 Lyttle became a Kings fan in the 1990’s, during the time The Great One, Wayne Gretzky, played for the Kings, leading them to the Stanley Cup Final in 1993, where the Kings lost to the Montreal Canadiens in five games. Staying true to being a Kings fan has traditionally been very, very difficult, with the team giving fans many more broken hearts than anything else prior to winning the Stanley Cup this season. 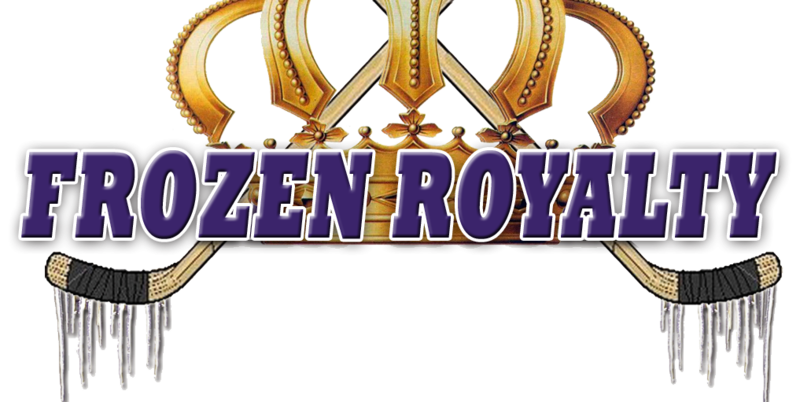 But for many Kings fans, their loyalties seem to be unshakable. “Sticking with my team has meant everything to me, and to see them push so hard to make it this year makes it even sweeter for me and my family,” Lyttle stressed. Lyttle was hooked on hockey after watching it for the first time. 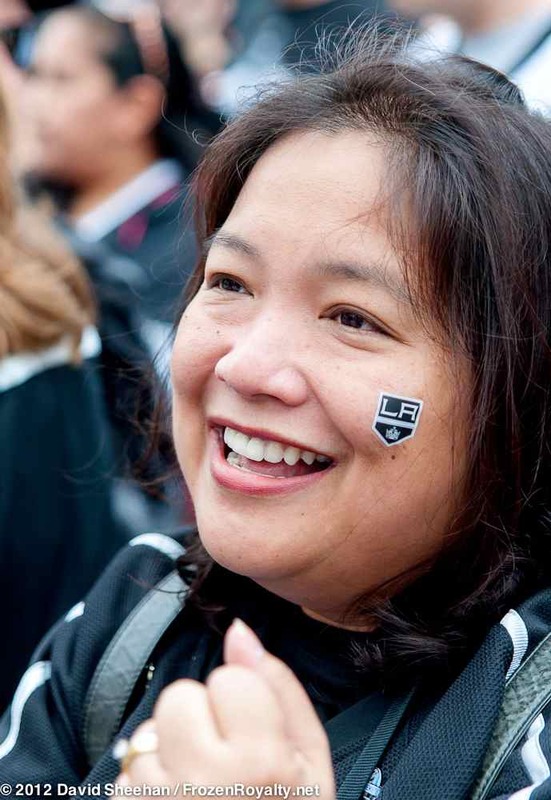 Carmel Esparrago Tobin, 42, of Duarte, California, also became a Kings fan during the Gretzky Era, after coming to the United States from her native Philippines, and had a similar experience. The more she watched, the more Tobin’s emotional attachment to the Kings grew. 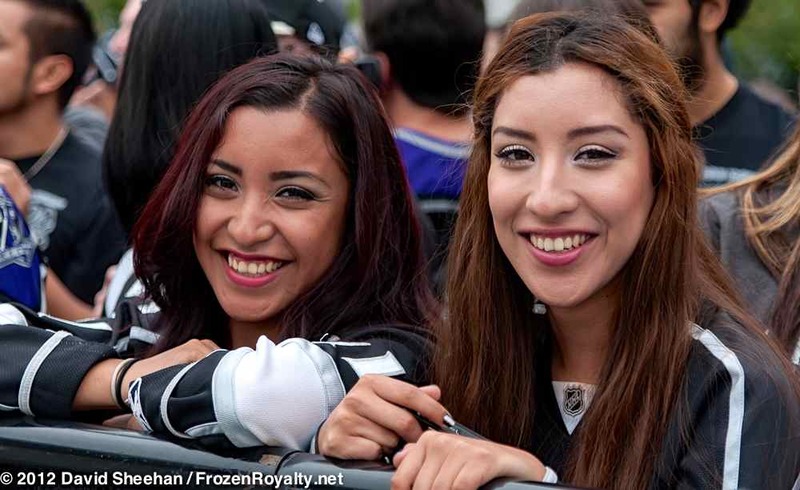 For sisters Nallely and Stephanie Lopez, the emotional attachment is already quite powerful, even though they became Kings fans just four seasons ago. The sisters have become such big Kings fans that they can often be found at the Toyota Sports Center in El Segundo, California, watching the team practice. Los Angeles area in 1967. “We try to go to practice whenever we can to support them,” said Nallely. They are also working to raise another Kings fan in the family. 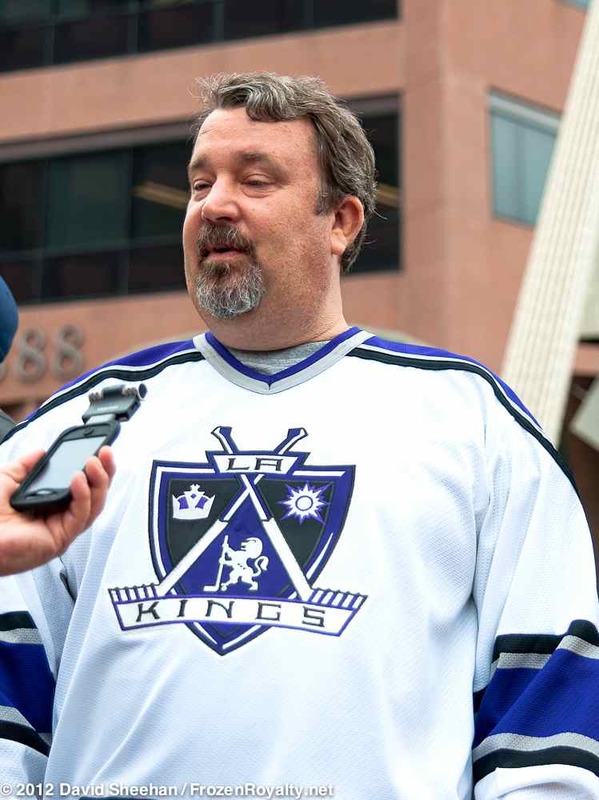 On the other side of the spectrum are the fans who have been following the Kings since the earliest days of the franchise, such as Ken Erichsen, 51, of Rosamond, California, a small, desert town off of California Highway 14, north of Lancaster, and just west of Edwards Air Force Base, about 83 miles from Downtown Los Angeles. Despite the long drive, Erichsen, a Kings fan since the beginning in 1967, knew he had to be at the parade. His friend, David Molina, 51, of Whittier, California, was also unable to fathom not attending. 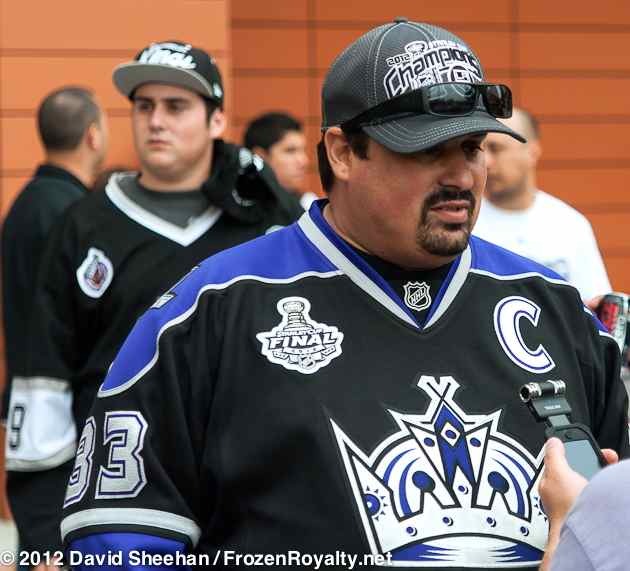 Molina has been a Kings fan for 37 years. One couple made the long drive from Albuquerque, New Mexico to attend the parade and rally. Unlike her husband, who is originally from the Los Angeles area, and has been a Kings fan since the early 1970’s, Jennifer was born and raised in Minneapolis, Minnesota. That was in 1995, two seasons after the Kings’ 1993 Cup run. The next season, they had season tickets, and they held onto them until they moved to New Mexico in 2008. Depending on what “generation” a Kings fan is part of, their expectations heading into the playoffs and the Stanley Cup Final varied, sometimes greatly. younger, newer generation of LA Kings fans. Newer fans were often very optimistic and relied on their faith in the team. For the fans who came in during the Gretzky Era, expectations were often quite guarded, to say the least. “I had that feeling, ‘we’re going to do it. We’re actually going to do it,’ and they did it,” added Lyttle. But for the old school fans, those dating back to the 1980’s and especially the 1970’s, few could escape the feelings of dread and doom that this team has engendered in its long-term fans since 1967. In the end, all the generations of Kings fans shared in the joy and elation of the moment. Although they shared all the same emotions with more recent fans, long-term fans had some different reasons behind them. LA Kings game in 1971. Even with the wisdom that comes from years of experience that the long-term fans expressed in their reactions, it was the younger generation that put the cherry on top of the sundae, so to speak. Indeed, after looking around, taking in the scene on Chick Hearn Court, the street between Staples Center and LA Live, and seeing the jubilant fans all around, Stephanie Lopez threw some icy cold water on those who contend that Los Angeles is not a hockey town. Indeed, the Kings’ Stanley Cup win could very well be just the start of something really, really good, here in the Los Angeles area and for the rest of the hockey world, too. ©2012 Los Angeles Kings. Used with permission. All videos provided by KingsVision at LAKings.com, or NHL.com require Adobe Flash Player. As such, they are not viewable on iOS devices (iPhone, iPad, iPod Touch). ©2012 Los Angeles Kings. Used with permission. It’s too bad more members of the Los Angeles Kings media do not have as much passion as you do, Gann. Great article! Thank you for mentioning this story in Chicago Elevated. A fatal flaw in your comparison of the number of fans attending the respective Stanley Cup parades is the fact that it’s a lot easier for the Blackhawks to get millions to their parades because 1) they’re an Original Six team with many more years of history and; 2) Their fan base is much closer to their arena. Here in the Los Angeles area, the Kings fan base is spread out over more than 300+ miles in every direction, and over eight counties. Add to that the fact that traffic in the metropolitan Los Angeles area is worse than anywhere else in the nation, it’s no surprise that we didn’t see millions in Downtown Los Angeles on a weekday. Those who fail to acknowledge this aren’t making a valid comparison, if you look at this objectively.